IN THE MIDDLE AGES, the Arabs, inspired by Mohammed’s faith, conquered the FERTILE CRESCENT, North Africa, southern SPAIN, and much of Central Asia, including IRAN and AFGHANISTAN. Arriving from the deserts of Arabia with a rich linguistic tradition but few material possessions, they soon were introduced to the ancient thought of INDIA, Persia, and GREECE. Within a century, the philosophy and sciences of these older civilizations were translated into Arabic, making it possible for books to be read from Spain to India. In addition, soldiers, sailors, merchants, and travelers from Spain to CHINA were to add information that developed Arab geography. Included in the medieval Islamic reception of these older scientific teachings were the works of geographers. Greek thought called the description of the Earth’s features, with the location of people and living things, geographia. It was a combination of natural philosophy (science still not differentiated from more speculative philosophical ideas), astronomy, histories, cartography, and travel reports. Many Greek thinkers, from the pre-Socratic philosophers to the great Hellenistic writers, had contributed to geographia, as it was received by the Arab geographers. These included Homer, Anaximander of Miletus, Xenephon, Herodotus, Arrian, Plato, Aristotle, and many others. The main contributors all wrote books specifically about geography. Eratosthenes, the librarian at Alexandria (Egypt), wrote a geographia and contributed the use of meridian lines. Poseidonius of Rhodes wrote a geography and accurately calculated the size of the Earth. Strabo wrote Geographica to describe in many volumes the MEDITERRANEAN SEA, its adjacent lands, and more. Claudius PTOLEMY, a Greco-Egyptian, wrote Guide to Geography. It was the most scientific and thorough geography work of ancient times. He located places with longitude and latitude, discussed mapmaking, and generally summarized Greek geographic knowledge at the peak of Roman power. Ptolemy’s geographia was the resource for geographers until the Renaissance. While the Arab geographers wrote in Arabic, many were not Arabs, but from ethnic groups that had converted to Islam. The Arab geographers included historians, astronomers, government officials such as postmasters, intelligence officers, travelers, as well as geographers. They were stimulated to study geography by the vast reaches of the Islamic world, the duty of the hajj, political control, and the great volume of commerce carried on caravans and in ships. The first of the Arab geographers whose work is still extant was a Persian, Ibn Khurradadhebeh (circa 800s). Writing in Arabic, he was in charge of a postal system and an intelligence service. His geographical descriptions of the Islamic world and beyond were extensive. Other Arab geographers of the time were Ibn al-Faqih (d. 903) and Ibn Rusteh (d. 910), who also wrote descriptively of what could be known of the world and its peoples. Other geographers wrote in the 900s, including Mas’udi (d. 956). He described people like the Slavs, Lombards, and others from travelers’ reports. He apparently used the work of al-Hakam, the emir of Cordova. The Galkhi geography school included a number of notable Arab geographers. Among these were Ibn Hawqal and Abu Ishaq al-Istakhri. They divided the world of Islam (Dar al-Islam) into 20 categories. The world outside they put into the “house of war” (Dar al-Harab), as a separate category. They used both the older geographic knowledge and materials from the Koran and the hadiths. Other schools, such as the Ikhwan al-Safa and the Ishraqi, described the world in zones and found symbolic meanings in “sacred geography” when concerned with holy cities like Jerusalem and Mecca. information in the work of Ibn al-Faqih was cited by Al-Yaqut (d. 1229), who composed a geographical dictionary. Both were relying in part on the report of Harun ibn Yahya, who had been a prisoner in Rome around 886. In the late 900s, Aby Rayhan al-Biruni (973–1048) (born in Khwarazm, near the Aral Sea) wrote a number of short scientific works. His Cartography, showing map projections, is still extant. Muhammad al-Qazvini (d.1283), used the work of earlier geographers like Ibn Ya’qub. The greatest of the Arab geographers was Al-Idris (1100–1165). Abu ‘Abd Allah Muhammad al-Idrisi is often called ash-Sharif al-Idrisi. He was probably the greatest of all the medieval Arab geographers. Al-Idris was born at Sabtah, (Cueta) in North Africa in 1100. He studied at Cordoba, lived at Marrakesh for a while, and then traveled in North Africa during his youth. He may also have traveled some in Europe as well. About the year 1145, al-Idris entered the service of Roger II of Sicily. Roger II was a Norman Christian king; however, al-Idris remained a Muslim. He continued at the Roger court as the royal geographer for the remainder of his life. It is likely that al-Idris stayed in Sicily to escape persecution. He was a Hummudid descendant and therefore a political threat as a legitimate claimant to the caliphate. Some Western scholars believe that al-Idrisi may have been seen as a renegade by other Muslims, because Muslim biographers wrote little about him after he joined Roger’s court. Al-Idris was a scientist, a geographer, and a mapmaker. He wrote three major geographical works. One of them is the greatest of all medieval geographical treatises. In addition, he is believed to have written literary and medical volumes. During al-Idrisi’s career in Sicily, he completed three major geographical works. Perhaps the most amazing was a silver planisphere on which was depicted a map of the world. The silver planisphere has been lost, but his maps and book have survived. 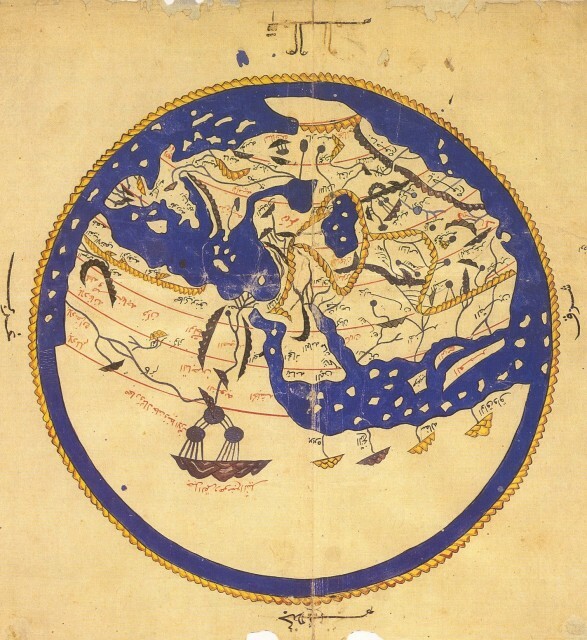 The second major work Al-Idris created was a world map. It consisted of 70 sections. The sections were formed by dividing the Earth north of the equator into seven climactic zones of equal width. Then each of the climactic zones was subdivided into ten equal parts by lines of longitude. Al-Idris wrote a geographical text intended as a key to the planisphere. This was his great al-mushtaq fi ikhtiraq al-afaq (The Pleasure Excursion of One Who Is Eager to Traverse the Regions of the World) and which also is known as Kitab Rujar or al-Kitab ar Rujari (The Book of Roger). The Kitab Rujar was a blend of empirical and rational methods. Like the Scholastics, he used materials from earlier Arabic and Greek geographical works. But this was combined with empirical information obtained through eyewitness reports. To get firsthand observation, al-Idris sent a group of people with training in geography and skill in drawing to a number of countries to record their observations. Other geographical works are attributed to al-Idrisi, including one (now lost) written for William I (William the Bad), Roger’s son and successor who reigned from 1154 to 1166, as well as several critical revisions and abridgments. Al-Idrisi’s scientific interests embraced medical matters as well geography. His Kitab al-adwiya al-mufradad (Book of Simple Drugs) lists the names of many drugs in as many as 12 languages, thereby giving a geopharmacology. He died in 1165 or 1166, but whether in Sicily or in his birthplace, Sabtah, is undetermined. Geographers who came after Al-Idris were Ibn ‘Abd al-Mun’im and Ibn Sa’ id al (1210–74). The latter wrote World Geography in Spain, where he lived. Ibn Battuta (d. 1377) was a devoted traveler who described vast areas of the Islamic world and Southeast Asia. Other travelers recorded the physical, human, and natural geography of the Islamic world as well as the routes of trade and travel. Among the historical contributors was Ibn Khaldun (1332–1404),who wrote the famous Al-Muqaddimah. It is an important book in the development of accurate history, and the opening chapters are an extensive geographical description of the peoples of the world. Other geographers were concerned with specific aspects of geography. Qutb al-Din wrote a treatise on geometry and is included in the Maraghah school. He worked with the problem of classified knowledge. He organized such knowledge as philosophical (al-hikmi) and nonphilosophical (ghayr al-hikmi). Geography was in the latter category as nonreligious and nonphilosophical (ghayr al-diniy). A significant problem for Arab geographers was to find the direction of Mecca in order to face toward it. The direction is marked in a mosque by a qibla. To properly position it was a problem of mathematical geography that had to be solved. Often geometry merged with astronomy. Various methods were developed, but by the 10th century, tables had been developed that would locate the qibla as a function of geographic longitude and latitude. Others, like al-Biruni, working in India and elsewhere, attempted calculations on the size of the Earth. The rise of the Ottoman Empire and other centers of Islam in the East shifted geographic writing into Turkish and Persian regions after the mid-1400s.